Chef Zach Gutweiler’s finessed creations are often tongue-in-cheek plays on something you’ve loved a long time. 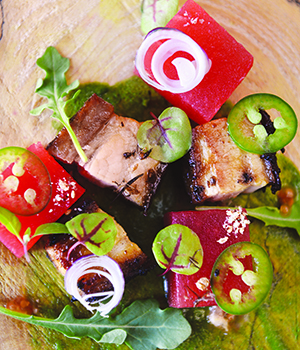 Take this colorful summer dish: It starts with roasted pork belly, glazed with caramel and served atop a green-tomato paint. If the watermelon looks impossibly red, it’s because Gutweiler compresses the fruit with tomato dashi (a kind of Japanese broth). Note the fresh greens scattered about, and there you have it: an unexpected—yet coherent and delightful—play on a BLT. P.S. : Those miniscule sprinkles on top? That’s furikake, a Japanese seasoning anchored by dried fish, sesame seeds and seaweed—but you already knew that, right? Indeed, most every touch from this kitchen veers winningly off the beaten path.